Author Philip Reeve and illustrator Sarah McIntyre are the talented minds behind Jinks & O’Hare Funfair Repair, and Pug-a-Doodle-Do! (the latter an activity book). Both are out now, published by the childrens imprint of Oxford University Press. I had the pleasure of meeting this talented pair at this summer’s Edinburgh International Book Festival, where I was hosting their event for Jinks & O’Hare. It was fascinating spending some time with them, chatting to them about their work, and seeing them get ready for their event, and the meticulous preparation they put in was only matched by their incredible stage presence. Combining humour and invention with audience interaction, this was one of the best events I’ve been in the audience for, let alone hosted, and I will happily admit to laughing lots. Amongst their hectic post-summer schedule, Philip and Sarah made time for some of my questions. Andy Jamieson: Jinks & O’Hare Funfair Repair is quite out of this world. What was the inspiration for the book? Philip Reeve: It started out as a story we did for the Phoenix comic – it was actually our first published story together! Sarah wrote it and I drew it, then Sarah coloured it. We wanted to do something spacey, and Sarah realised that when funfairs feature in children’s stories they’re almost always scary, spooky funfairs, or fronts for criminals or something. That’s adults find them quite threatening, alarming places, I think – but children don’t; children think they’re magical! So we wanted to create a funfair story where the funfair really is fun, and somewhere you’d like to go. We always thought it would be nice to expand it into a book, but we had other stories we wanted to tell first. Sarah McIntyre: Yes, I used to love building funfairs out of Lego, but they never quite lived up to what I could imagine. It was great trying again as a grown-up, and I even took a trip to Disneyland Paris – tax deductible! – to get myself back into a funfair frame of mind. (My younger self would have been staggered by that being part of my job!!) A whole planet of funfair seemed even cooler than merely a park on a planet. AJ: You’ve both worked together on quite a few books now. What is the secret to a successful artistic collaboration? PR: I think you have to be very open to the other person’s ideas, and prepared to compromise your own to fit their stuff in, because that way you end up generating new ideas which neither of you could have come up with alone. 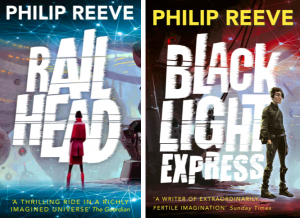 I’d written a lot of books on my own when I started working with Sarah, and I was keen to stop being Philip Reeve for a bit and be part of a duo. Of course, I wouldn’t be happy doing that if Sarah wasn’t a really good writer and illustrator as well as a good friend – I LOVE her drawings and the way her mind works, so it’s great to be able to join in with her ideas. The whole writing process for those books is a bit like a game, really, we just chuck strange ideas to and fro and laugh at our own jokes a lot. And, of course, I can still go off and write my own books if I want to but these days I tend to run the early drafts of those past Sarah, too. SM: Same! Philip was a lot of help on my latest dinosaur picture book; we bashed out the idea for the story in a pub, which is why I’ve dedicated it to him. He’s so good at adding great little jokes, which I’m sure at least partly comes out of his training as a Horrible Histories illustrator. AJ: Do you have any further plans to create more books together? A sequel to Jinks & O’Hare perhaps? PR: We’ve just published an activity book, Pug-A-Doodle-Do!, which is based on the characters from the four story books we’ve done together. It’s a mixture of drawing and comic-making activities and silly stuff we’ve written – Iris the Mermaid’s Beauty Tips, a ‘Which Reeve & McIntyre Character Are You?’ quiz, things like that. It made us laugh a LOT while we were coming up with it, so hopefully other people will find it funny, too. And if not, they can write/draw better jokes in all the blank bits. AJ: Do you remember when you first met the other? PR: I saw Sarah at the Carnegie Medal awards back in 2011(?). She came up and asked to take my photo, and I had no idea who she was, I thought she was a journalist from the Bookseller or something, but she was a nice smiley one, so I enjoyed meeting her! Then, later that year, I found myself sitting opposite her and her husband Stuart at a dinner at the Edinburgh Book Festival. We got talking that evening and we haven’t stopped since. SM: Philip and I were talking in Edinburgh about drawing, and I was saying how I’d been posting a drawing every day on my blog, even if I didn’t like it, as a sort of discipline. Philip went away and started posting the most amazing landscape drawings from where he lives, in the middle of Dartmoor. I realised I didn’t have all that much skill at landscapes, so I started going to Greenwich Park, and every day we’d keep an eye out for each other’s work. It was great until winter set in, and neither of us wanted to be the first to give up, even though we were freezing our fingers off. Eventually Philip invited Stuart and me to visit his family out out Dartmoor and I was able to see these beautiful mossy walls and gnarled trees he’d been drawing, and do some drawing with him. AJ: You both have an incredible stage presence at your live book events. How much planning and preparation goes into your events and book tours? PR: One of the things we’ve always agreed on is that authors who are doing events need to try and be a bit larger than life – you need to dress up if you’re going on stage, and if there are two of you you can take it a step further and do sketches and songs and things – we basically do a kind of very loose variety show based on each book. But Sarah lives in London and I live in Devon, so we don’t meet that often, and there isn’t much time to rehearse our events – we usually just talk through a kind of rough outline of what we’re going to do, and then make the rest up as we go along. It seems to work – Sarah is one of those people who people just like, so all I have to do is try to keep her from going off on wild tangents! SM: I think most illustrators are naturally a bit shy, but somehow putting on a very big persona and a fancy big dress makes it easier. And being able to riff off Philip makes it feel much funnier, not like I’m some completely mad person. He’s still teaching me a lot about putting together stage shows. AJ: How is work progressing on the third instalment in the Railhead trilogy? Do you have a title yet? PR: It’s just about finished, and it will be out in May 2018. It’s called Station Zero. AJ: What writing plans do you have beyond the final Railhead book? PR: None! Before, when I’ve finished a book, I’ve always known exactly what I’m going to do next, but I don’t really feel any desire to start another novel at the moment. But that’s quite a nice position to be in. I think I’m going to just concentrate on doing new stories with Sarah McIntyre, and I daresay another idea will come along eventually. AJ: The film adaptation of Mortal Engines is due in cinemas December 2018. What can you reveal about the film version? Have you seen any footage? PR: I can’t reveal much about it, except that I watched some of it being filmed and the actors and sets looked great! I saw a tiny little bit of cut-together footage, very rough, with none of the special effects in place, and it was already quite spine-tingling. I think it’s going to be amazing. AJ: What advice do you have for aspiring writers? PR: Just read a lot, and write a lot – but if you want to be a writer you probably do those things anyway. I don’t really like writers’ tips, so maybe my advice would be ‘ignore all writing advice’ – if you’re honest with yourself you’ll know whether what you’ve written is any good or not. Oh, and learn to type, because you’ll be doing a lot of that. AJ: Do you have a favourite book that you come back to? PR: I often go back to books I enjoyed when I was growing up – Rosemary Sutcliff’s historical novels, The Lord of the Rings, Asterix – it’s partly nostalgia, but I see new things in them each time. As an adult I have less of an inclination to re-read things, but if I’m bored or out-of-sorts I often go back to Patrick O’Brian’s nautical novels about Jack Aubrey and Stephen Maturin – they’re surprisingly funny, and I’m very fond of the characters, so it’s like looking in on old friends. AJ: Are you working on any new picture books, or other such projects? SM: Yes, quite a few things! Years ago I wrote and drew a comic called Vern and Lettuce, about a sheep and a rabbit who live in a tower block in an animal-populated London, and recently I’ve been allowed to dive back into that world! It’ll be a picture book called The New Neighbours, and I think it touches on a lot of issues about rumours and immigration as well as just being a fun story about a motley collection of cute animals. 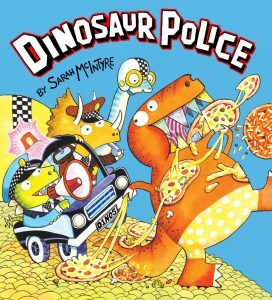 That comes out in March with David Fickling, and I have another picture book coming out in May with Scholastic UK, a follow-up adventure to Dinosaur Police (final title still secret!). AJ: You’ve had a number of collaborations with various writers over the years, as well as working on your own projects. What are the perks and challenges of these different creative processes? SM: I love working with other people, particularly when it’s really a collaborative project between friends, where we get to throw around ideas together. One of my early picture book contracts was for Jampires with David O’Connell, and we both wrote the story and both drew the pictures. With the Reeve & McIntyre books, Philip does the writing, but we still throw around lots of ideas together, and he helps out with the pictures. Stage events with him in front of hundreds of children are SO much more fun than doing them alone! But I also feel I need to write and illustrate my own picture books; a lot of people in the literary world, teachers and parents still don’t take illustration seriously as a profession and there’s a lot of pressure on illustrators to write our own books to build names for ourselves. We shouldn’t have to, illustration is a highly skilled career, but it’s why I set up the #PicturesMeanBusiness campaign, so that illustrators could get proper name credit for what they do. Hopefully it’s one thing that can help give our best illustrators a better chance at being able to make a living at this job. (The reason I can speak out about it is because Philip, our publisher and our agents are so supportive of my career, but not all illustrators are so fortunate.) People can find out more at picturesmeanbusiness.com. AJ: Out of all the books you’ve worked on which are you most fond of and why? SM: I’ll always have a special place in my heart for Oliver and the Seawigs because it’s the first time Philip and I thought, Hey, we could make a book together! And I have a lot in common with Iris the mermaid, who features in it. Of my own books, it’s probably Vern and Lettuce, when I felt I really got into the swing of storytelling. Vern is very much like my husband, Stuart, so it was fun to see him play out various scenes in sheep form. I’m excited he’ll get to return in The New Neighbours. AJ: Do you have a favourite illustrator (alive or dead)? SM: Well, probably Philip, because it’s so much fun sitting at my desk drawing with him! We had such a laugh creating Pug-a-Doodle-Do!, and you’ll have fun trying to spot which bits I drew and which bits he drew. I also love work by Maurice Sendak, Satoshi Kitamura, Posy Simmonds, Kate Hindley, Jonathan Edwards, and Bill Watterson (who created the Calvin & Hobbes comic strips). AJ: You have a very distinctive fashion style. What are your stylistic influences, and do you have a favourite outfit? SM: Why, thank you! I live in a neighbourhood with lots of shops that sell Ankara wax print fabric, that is very popular with Nigerians and Ghanaians here. I visit the fabric shops like I’d visit an art museum, and keep a library of fabric back at my studio. When I have a festival or new book coming up, often my fabulous Ghanaian tailor, Esther Marfo, will use one of the bolts of material to whip me up a new dress. Favourite outfit? Probably the silliest one: the six-foot-tall Marie-Antoinette-style wig that my sculptor friend Eddie Smith and I made out of cling film for the Oliver and the Seawigs launch. It was so heavy – it almost made me fall off the ship where we had the book launch – but it was pretty jaw-dropping. Many thanks to Philip and Sarah for their time, and to Hannah Penny at OUP Children’s for arranging the interview. 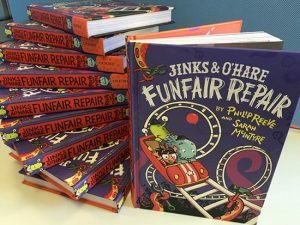 Jinks & O’Hare Funfair Repair and Pug-a-Doodle-Do! are out now, published by OUP Childrens.